The hard-driving husband-and-wife rock act that hits the stage as Pat Benatar and Neil “Spyder” Giraldo is responsible for more than a handful of stalwart classic-rock jams. 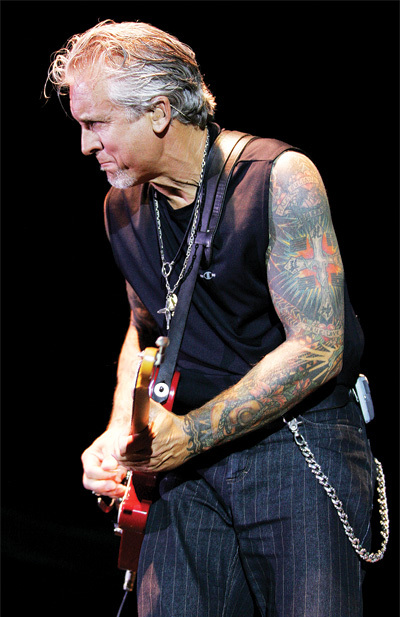 For the past 15 years, Benatar and husband/guitarist/producer/co-writer Giraldo have spent many of their summers touring, then scratching their itch to perform with one-off and weekend gigs throughout the remainder of the year, “…to stay sharp and work on new songs and arrangements,” according to Giraldo. This summer is no different, as the two and their band are all fired up to hit the road along with two other acts that know a thing or two about megastardom. How’d you decide to hook up with Journey and Loverboy? Our agents are always trying to find a varied package to take to good-sized venues. Money’s tough – this recession has been difficult for people, but everybody needs entertainment. When people spend money, they want to have a good time. Journey is a nice bunch of guys, and have a lot of great songs. People love them. Our sound is a little more aggressive, so it’s a good combination, I think. The guys in Loverboy are a nice bunch, too. You run into everybody when you’ve been around as long as we have. What gear are you taking out? Well, for amps I’ll take the same little Marshall combos I have from way back. I loaded them with EV speakers and they’re pretty clean, but can get loud enough that I have to turn them around. I don’t use many pedals – just a delay and a little harmonizing effect for one amp. For guitars, I take Fender Teles, which I love, and a couple of BC Rich Eagles. They’re making great guitars again. And then I’ll take a couple GMPs, they make beautiful guitars, as well. Everything has a Bigsby, and they all have Seymour Duncan pickups. I’ve known Seymour for 30-some years, and he puts an interesting match in the Teles for me. I have a ’64 Tele I call my “Muddy Waters guitar” that has a great bridge pickup; it sustains, but doesn’t sound mushy or thrashing – clean, but biting. And Seymour gets me stuff that’s really close to it. In the BC Rich and GMP guitars, I started using these hybrids he did that are a cross between a humbucker, a ’59 PAF, and a Super Distortion, which again, doesn’t get mushy but keeps a bitey front end to it. There’s a great story about what Seymour did with some Strats I had him make back when he was still working in his garage. At the time, Jeff Beck asked for Strat pickups at the same time I did. So Seymour made them, but sent the wrong ones to each of us! So, Jeff got mine and I got Jeff’s. I told Seymour, “These are amazing! I love them.” He goes, “I’ve got a problem… You gotta send ’em back, they were for Jeff Beck, not you.” I go, “Nah, c’mon! I love these.” So he calls Jeff, and Jeff tells him, “I’m not giving mine back either…” (laughs)! With your rig, are you going for a sound consistent with that we’ve heard on your hit songs? I’m not trying to do anything different, but so much comes from your hands that I don’t think you can disguise your tone. You can distort an amp, add treble, whatever… you still sound like you. Patricia and I are working on new songs, as well. And there are some I started years ago. We’re going to put them in the set this summer, and then maybe by the end of the year we’ll have them ready to record. Who’s in the band going out this summer? Chris Ralles has been our drummer for quite a few years. Mick Mahan is our bass player and has been with us for 15 years… maybe longer. It’s basically a three-piece, but we make a lot of racket, and it works out really well. They’re great players, so it’s easy. On The Rock Nutrition, yeah. I’m a fanatic about fitness, and once I got past 30, working out – jumping rope, running, lifting… my body was getting beat up. So I started taking supplements, and I thought, “Maybe I should come up with something of my own,” and I began to formulate. My first product is one that supports digestion and helps with acid reflux. It’s exciting because, on the road, we eat lousy, drink some, stay up late, then feel like hell. My stuff actually makes you feel good in 20 minutes. Once I started testing it on people, they loved it. I’m looking to get the right people involved so we can go great guns with the company. Do you work out daily? Oh, yes. I wake up, have a bit of fruit, drink a ton of green tea, run three or four miles, go in the gym, then maybe play golf, do the gig if we’re playing, eat dinner, that’s it. That’s my day. A little bit. But I had an ulnar nerve entrapment injury last year and it almost felt like the end of my career. It was a horrible. Since then, I had to lay off a little, and I learned to do some stretching in place of the weights. I do some weights, but I can’t do what I used to because I have be careful to support the ulnar nerve. If that goes out again, I’m kind of screwed. Is it a challenge to maintain that routine on the road? No, it’s actually way easier because there’s no responsibility other than the gig. No distractions. This article originally appeared in VG September 2012 issue. All copyrights are by the author and Vintage Guitar magazine. Unauthorized replication or use is strictly prohibited.